Freeland is a small town sitting on a mountaintop, and it is connected to surrounding areas by large and small roads and highways. 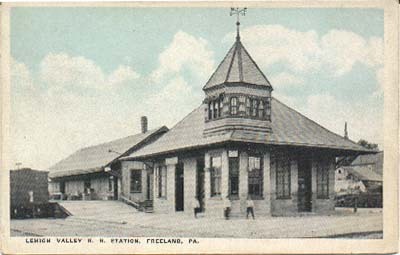 But in its earlier days, Freeland was also connected to the outer world by both trolley and train tracks. All of the mining towns in the area had train tracks running to or through them so that coal could be transported out, and those same rail tracks brought immigrants and visitors to the area, and facilitated travel and shipping. 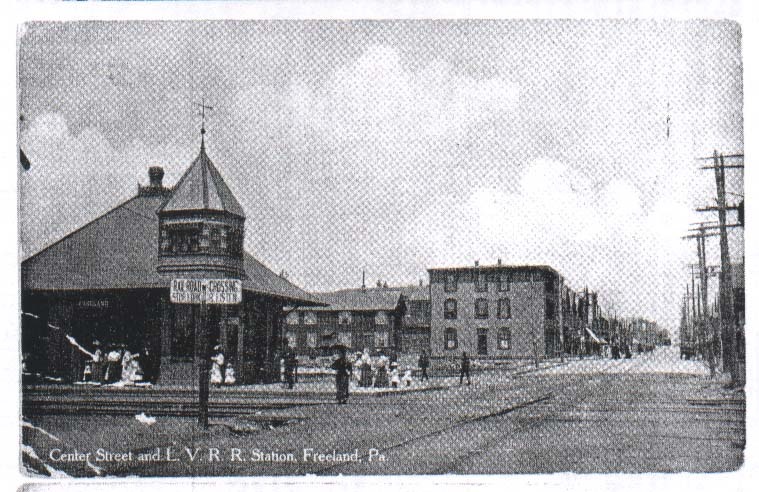 The photo at the top of this page shows the Lehigh Valley Railroad depot and freight house on lower Centre Street. Both buildings are long gone, but in the early 20th century they were the site of much activity. 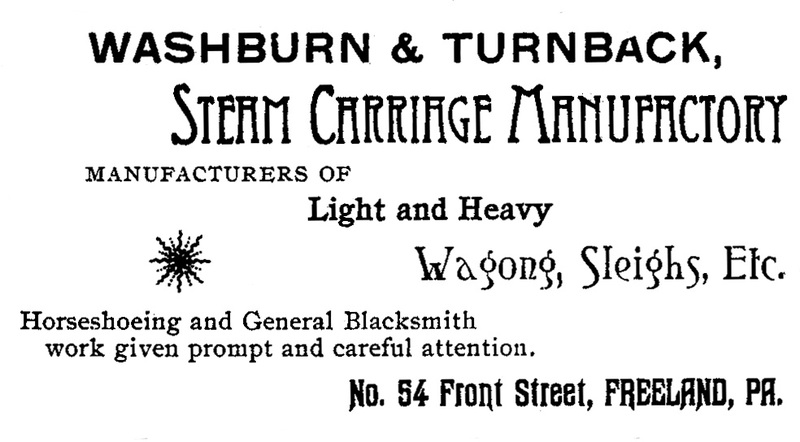 Capitalizing on the comings and goings at the station, various businesses such as lumber and beef companies were located along the tracks for ease of shipping, and enterprising businesses such as Peter Shambora's bar were convenient to travellers, as suggested in this descriptive ad from 1895. In addition to the railroad, Freeland enjoyed regular trolley service. In 1894, work was begun by the Lehigh Traction Company on a trolley line between Freeland and Harleigh, The trolley ran until 1932, and the last of the tracks were pulled up in the mid-1960s as part of a repaving project, as reported in the Freeland Penny Saver. The tracks ran right up the middle of Centre Street. This postcard, looking north from below the train station, shows the intersection of the railroad and trolley tracks on Centre Street below Carbon. But even more basic than the trolley and train lines were the roads leading into and out of town. In 1845 William Birkbeck made a road through the woods from South Heberton to Eckley and Buck Mountain. What is now Schwabe Street was a wagon and stagecoach road, referred to on some maps as the Butler-White Haven road. Several hotels along what is now lower Birkbeck Street, such as Krouse's Hotel and Livery (the hotel building was burned by arsonists in the past year, and the livery stable still stands but is in disrepair), served the stagecoach travellers. As early as 1878, stagecoaches were also running from Hazleton to Freeland. In 1890 a new road to Highland was opened. These roads were not made for cars and trucks. In Freeland's early decades, there were no automobiles. Road travel was accomplished by horsedrawn wagons, carriages and sleighs (as well as by horse and on foot). So, instead of having new and used car dealerships, garages, auto supply stores and gas stations, Freeland had carriage and wagon manufacturers, saddle, harness and hame makers, blacksmiths and wheelwrights, as well as livery stables. 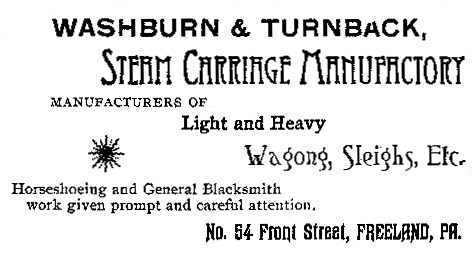 Early carriage, wagon and sleigh makers included Peter Brown, John P. Cunningham. Owen A. Peters, Michael Halpin, A. W. Washburn, and the Hontz Brothers. The photo below of the Hontz Brothers' carriage works comes to us courtesy of Carol Jones; also shown are the notes written on the back of the photo. The carriage and wagon makers did business not only in Freeland but throughout the surrounding area and, in some cases, even further afield. This was also true for the saddle, harness and hame makers. 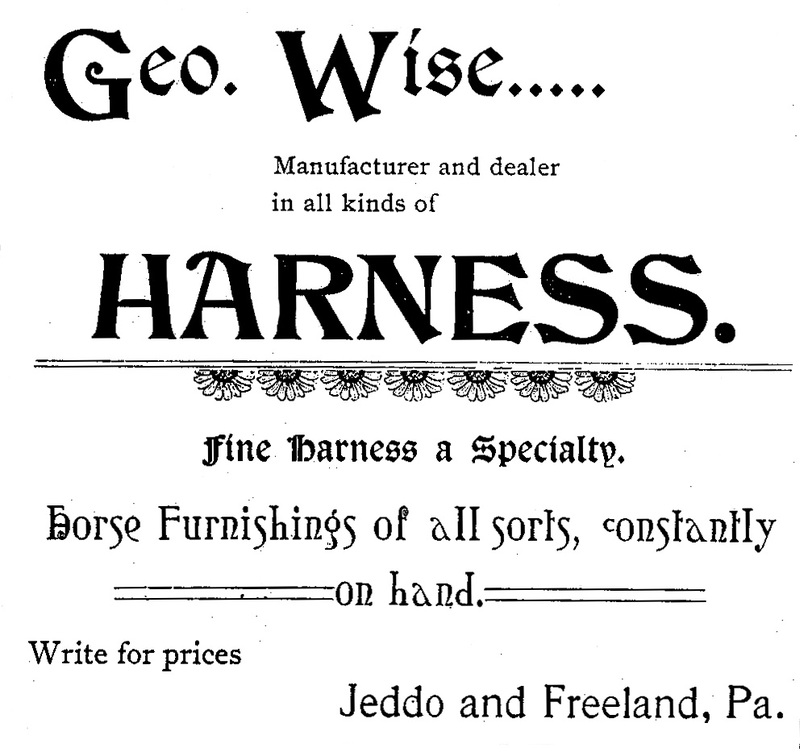 George Wise had a thriving saddlery and harnessmaking business for decades. 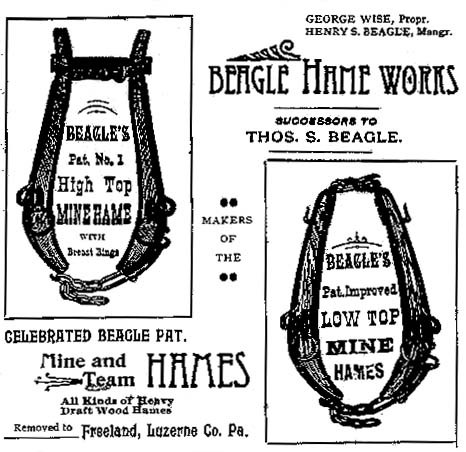 The Beagle Hame Works was very well known, and the 1910 Encyclopaedia Britannica mentioned hame manufacturing as one of four industries in Freeland. Hames were the collar-like items that were used to yoke horses and mules, as shown in this Beagle Hame Works ad. In addition to the vehicles and accoutrements needed for horse travel, there was a considerable amount of maintenance involved, both of the vehicles and of the horses themselves. 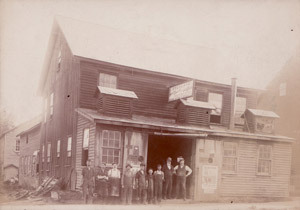 Freeland blacksmiths and wheelwrights in the late 19th century included Jacob Fox and Bro., Peter Henninger, Elias Shelhammer, A. W. Washburn, W. J. Boyd, S. G. Debman, Charles Eastwood, G. B. Hoch, William Jenkins, and R. E. Roth. Local livery stable owners included Conrad Smith, John Rugens, John and Henry Fisher, Gottlieb Fullmer, Mrs. Ann Donop, Frank O'Donnell and John Krouse. This photo of Harry Fisher, of the Fisher Livery Stable on Washington Street, gives us a view of horse-drawn coach travel. 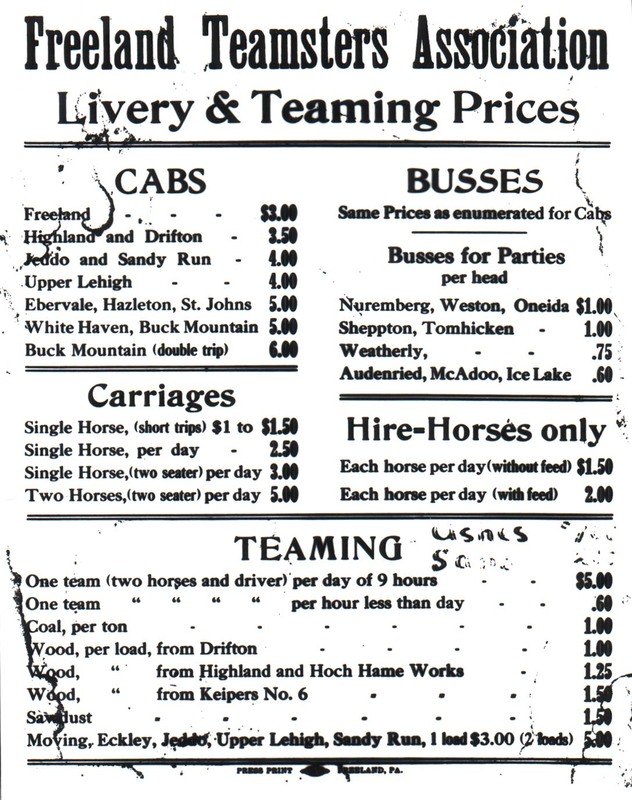 Livery stables provided horses for use, some provided stabling, and some even sold horses. Horses were also sold independently. 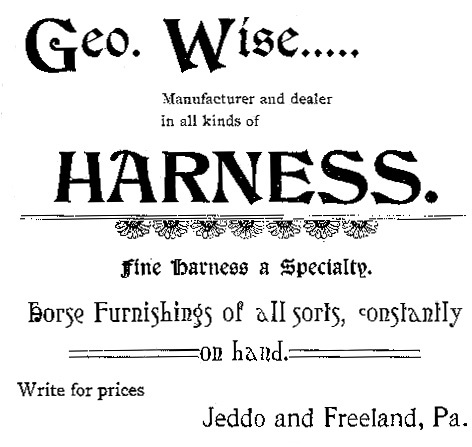 In his 1893 History of Luzerne County, Bradsby reports that Mathias Schwabe did "a great deal of horse dealing, sometimes buying blooded horses by the carload." By the early years of the 20th century, automobiles were beginning to replace horse-drawn carriages as preferred means of transportation. Some livery stables turned into garages, for awhile providing both kinds of service and then before long turning from horses to motors. An example of a Freeland business that made that transition successfully was Fisher's Livery Stable at 525 Washington Street. John Fisher's Livery is listed at that address in the 1901 city directory (the photo at right, from Bill Smith, shows Harry Fisher next to the sign for John Fisher Livery); Charles Fisher is listed there in the 1921 city directory (Charles Fisher, Liveryman - Moving and Teaming Given Prompt Attention - Stables, Washington Street); and then in the 1928 city directory Harry Fisher is listed at that location under Automobile Repairing and Service Stations. So before automobiles and trucks came into use, goods and people were hauled by teamsters, men who drove teams of draft animals (usually horses, but sometimes mules) pulling carriages or truckbeds of some sort. In the early 20th century teamsters formed unions in order to regularize their work, hours, pay, benefits, and also to gain some protection from the risks to body, vehicle and cargo that they faced regularly in their work. Eventually teamsters were truck drivers rather than drivers of teams of horses. 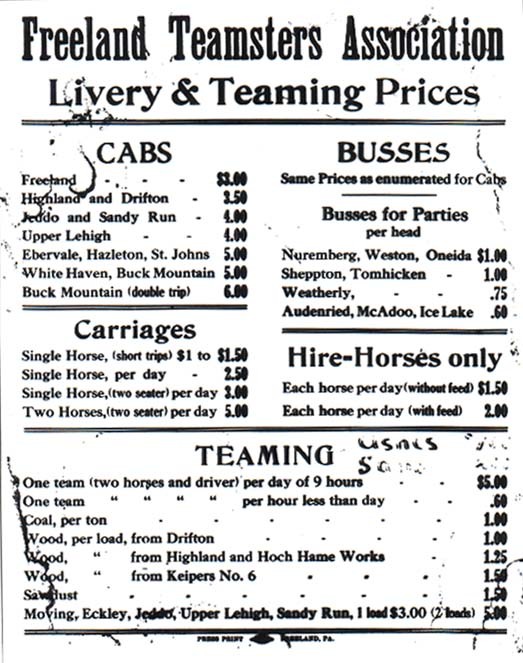 At left, courtesy of John Zubach, is a poster showing the livery and teaming prices for the Freeland Teamsters Association. And, leaping forward in time, at right is an ad from the Lehigh Valley Railroad in December 1929, advertising the availability of radio reception on their Wilkes-Barre to New York Express, from Ed Merrick. Credits: Thank you to Bill Smith for the photograph of his grandfather, Mr. Harry Fisher, shown next to the Cottage Hotel and the Fisher Livery stable. Thank you to Carol Jones for the photo of the Hontz Brothers' Carriage Works. Thank you to John Zubach for the Freeland Teamsters Association poster. And thank you to Ed Merrick for the LVRR radio reception on the trains ad.